Outer Space and celestial bodies fascinate everyone, including children. Many countries invest lots of time and resources in exposing children to space research. Space exploration can also serve as a stimulus for children to enter the fields of science and engineering. How should we begin with it at the school level? Phases of the moon are easily observable from anywhere. Children can, on their own, collect data on the moon’s shape and its times of rising and setting, and observe patterns in the data. Gradually they should come to visualise the sun-earth-moon configuration and reason out how the moon’s phases occur. In India we follow a variety of luni-solar calendars and almost all of our festival dates are determined by the the phase of the moon on that day. What better way to place science in a cultural context? 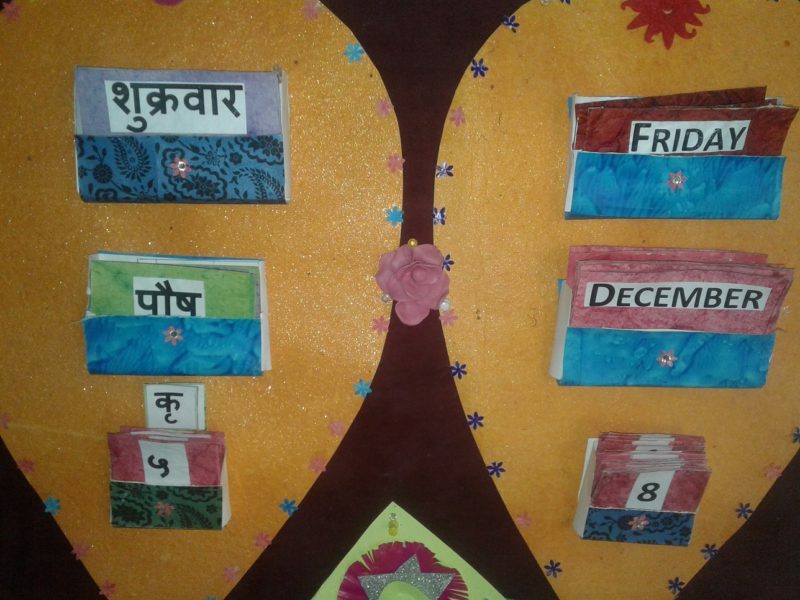 Calendar designed by teachers accommodates both Gregorian and Vikram Samvat dates. Here we explain the curriculum of the Indian Calendar at our school. One can find more details about various versions of Indian Hindu Calendars and the astronomical concepts behind them on the website of the Positional Astronomical Centre of Indian Meteorological Department. They also publish the national calendar of India, Rashtriya Panchang, with the objective of unifying the divergent practices of Hindu calendar systems existing in different parts of the country and also to promote “panchanga” calculations on a modern scientific basis. Festivals of different communities and also various language versions of the panchangas are available on this website. At our school we use Vikram Samvat, which is a commonly used luni-solar hindu calendar. The Hindu calendar is known by the Sanskrit word “panchangam”. Since a period of twelve lunar months fall short of a solar year by 11 days, an additional month is added to the calendar at five-yearly intervals. This month is known as the “adhika”. Each month is divided into the two cycles (waxing and waning) of the moon (new moon to full moon and back). The period of the new moon is called “krishna paksha” and the period of the full moon is called “shukla paksha”. The Indian Calendar Reform Committee, appointed in 1952, identified more than thirty well-developed Hindu calendars, in use across different parts of India. There are two main calendars in the Hindu system. In North India, the month generally begins with the full moon, and in South India with the new moon. Festival days will still fall on the same day, or very closely, but the name of the month may be different. For example, Krishna’s Birthday falls on the eighth day of the dark moon; in the North this is in the month of Bhadra; in the South in Shravana. Well that’s a bit complicated to begin with. Choosing the “perfect calendar” for our school was very confusing. In the end we decided that it didn’t really matter which calendar we follow, as our main objective is learning its co-relation with lunar cycles. We decided to go with Vikram Samvat which is the most popular version in Madhya Pradesh and hence most festivals in our region rely on its dates. The luni-solar Vikram Samvat calendar is 56.7 years ahead (in count) of the solar Gregorian calendar. For example, the year 2074 VS began in 2017 CE and will end in 2018 CE. For finding out the correct tithi every day we refer to the dates published in the local daily Dainik Bhaskar. India has a diversity of religions. At present our school is small with a fairly homogeneous student population. As we grow in experience and diversity we may find the need to enrich our curricular content. For now we simply keep this converter as our reference. We have introduced Grade 1 in this academic session and it is the senior-most class at our school. The curriculum outlined below is an extrapolation of what we have been doing recently, to what we expect to do in the coming years. This sequence is distinct from, and accelerated in comparison with what is outlined in the Small Science curriculum. Depending on our experiences the actual content might change over the years. We will keep you posted! Learn the names of days in a week (Somvaar, Mangalvaar, etc.). Understand the concept of day and night with the help of a globe. 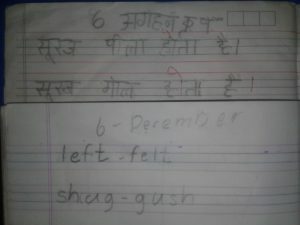 Read the date from school calendar and write in Hindi notebooks every day. Understand the tithi and paksh system. Observe the moon regularly at home. Learn names of planets in our solar system and their relative position to each other. Organize at least 2 night-out sessions at school and observe the sky. Understand the dates of major Indian festivals and link them to the phase of moon (eg. Krishna Janmasthami falls always on the Krishna Paksha Asthami of Shravan month in Vikram Samvat era). Small Science Class 4 Teachers’ Book on pp. 74-75 shows phases of the moon for festivals of different communities in India irrespective of specific calendars. Observe timings of moon-rise and moon-set every day. Klaus K. Klostermaier (2007). A Survey of Hinduism: Third Edition. State University of New York Press. pp. 490-92.